When your nonprofit tells a powerful story that inspires your members, or even a funny one that makes them laugh, you establish a human connection no matter what channel you use to share it. "It’s global connective tissue," said Stacey Monk, co-founder of Epic Change, who was part of the panel Up Close and Personal: How Storytelling Builds Movements at NTC along with Mark Horvath of Invisible People, Estrella Rosenberg of Big Love, Little Hearts, and moderated by Avi Kaplan of Rad Campaign. Now more then ever, nonprofits are facing donor fatigue as activists and donors are getting slammed with fundraising alerts through direct mail, their inboxes and when they login to Facebook and Twitter. “People are so tired of getting tweets saying give me money. It doesn’t work,” said Horvath. Nonprofit campaigners and fundraisers need to take a step back and focus on re-connecting with their members – not treating them like ATM machines or clicktivism robots. How can you start re-connecting with your members and potential supporters? Tell your story. And I don’t mean a boring one that’s been edited 10x by senior management and contains wonky policy messaging. Tell a real story. No red tape. No policy jargon. Here’s some tips to think about as you experiment and go down your storytelling route. Why Was Your Organization Started? Don’t share 20 reasons why it was started. Focus on the main one. For many organizations (especially advocacy), there is an incredibly personal story behind it. For example, Rosenberg started Big Love, Little Hearts which works to provide life-saving surgery to children with congenital heart defects in developing countries because her younger sister died from it. Rosenberg is fiercely open about her personal experiences and shares them through video, blogging, emails, and through social networks. Even though Rosenberg’s sister died over 20 years ago, she says she remembers her sister’s passing as if it was yesterday and that emotion is conveyed in much of her storytelling. On one recent video, Rosenberg received over 1000 responses. Get Your Story Out Across Multiple Channels. 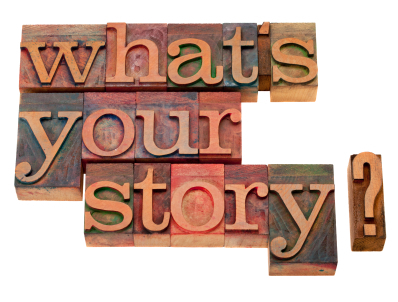 Don’t just rely on email to tell your story. Film it. Don’t have a fancy camera or crew? Not a problem. You can use an inexpensive flip cam, which has surprisingly decent sound and picture quality for the web. Share the story on social networks like Twitter. Yes, tweeting 140 characters at a time can be annoying when you have a lot to say, but spending time with your community on social networks - sharing and listening to their own stories about your issues is exactly what you should be doing on social networks – not just promoting your blog posts or latest actions. It’s not called “social” for nothing. Forget the Wonk! Unless your members are comprised of Hill staffers or lawyers who like to talk policy jargon all day long, loose the wonk. Telling your story and advocating for policy change is great, but getting all policy wonky with your members can often leave them saying “what the heck does that mean,” Delete! Break things down and make it super easy for them to understand. Plus some policymakers admit to being influenced by personal stories over statistics and jargon. Inspire Hope Not Doom. We live in a world filled with beauty and tragedy. Our members battle that every day and inspiring hope is an essential part of storytelling. Your members don’t need to be constantly reminded about doom and gloom and carry more weight on their shoulders. They need to be inspired that their contribution or their volunteerism is going to make an impact and help move the needle. Test and Make Mistakes. Be Human. Did you know that the most innovative companies in the world (like Google) embrace failing fast? Nonprofit should too. “When you show them that you are human and make mistakes, you also show them how awesome you can be too. That’s business. Failing fast and making mistakes along the way,” said Rosenberg.